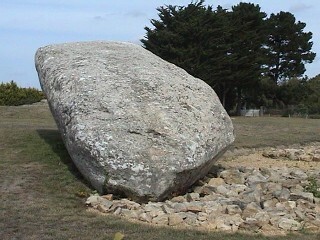 Le Grande Menhir Brise, France. 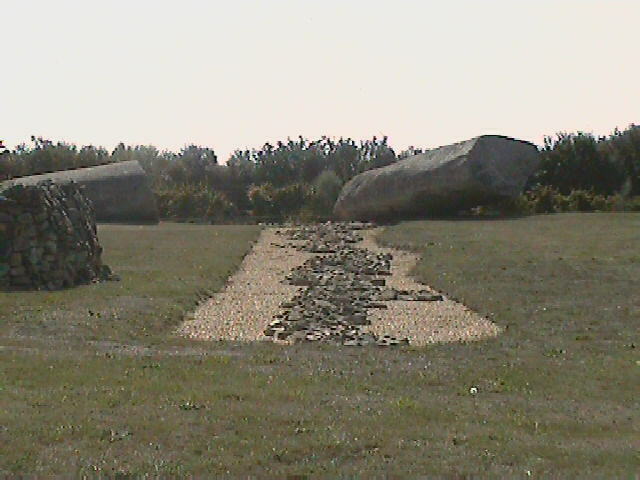 Le Grand Menhir Brisé: (Menhir, Alignment). This stone has the honour of having once been the largest (known) standing stone in Europe and the largest of a huge 19-stone alignment. Today the menhir is broken into four pieces which still lie where they fell. 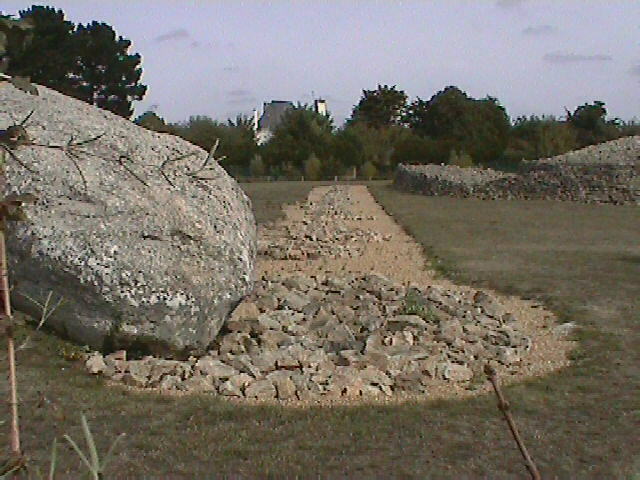 Le Grand menhir lies alongside La Table des Marchands passage-mound, and the Er-Grah tumulus, both built at around 3,300 BC, following the destruction of the original alignment, which is now suspected of having been broken up and distributed around the Morbihan area (see below). 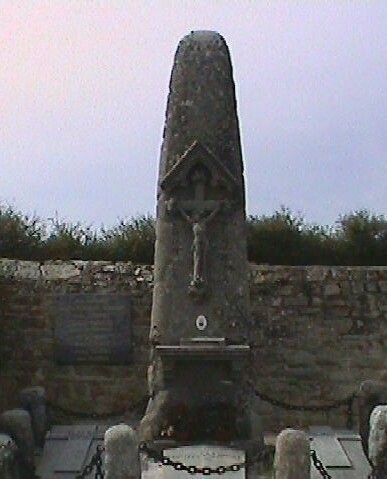 Le Grand Menhir is one of three structures at the Locmariaquer site. It lies beside the Er-Grah tumulus and the Table des Marchands, both built around 3,300 BC. It is also the last surviving stone of an earlier construction dating from around 4,500 BC (6). The original structure is thought to have been broken around 4000 BC. The stone, now fallen into 4 pieces, is estimated to have weighed about 355 tons when complete and to have stood over 20 metres high (1). It was hand 'mauled' into its present shape and an axe-plough figure was once visible on the middle fragment. 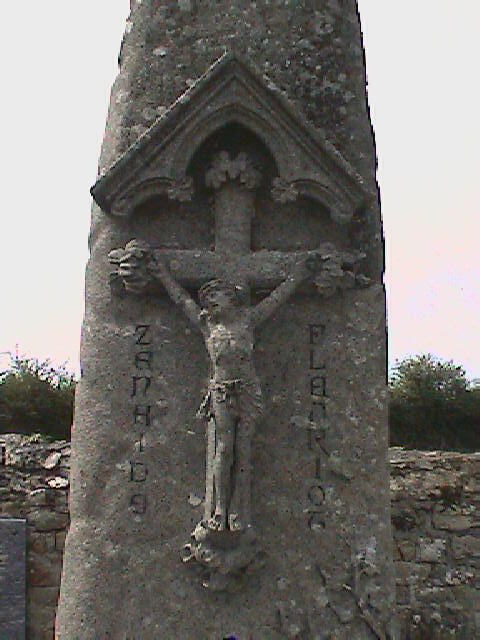 John Michell reports the nearest source of similar stone at over 50 miles distance (4), and even though newer reports suggest a distance of only 10km north of Auray (5), it still highlights the fact that the location outweighed the difficulties involved in transporting such large stones over long distances. The transport of such large stones from such a distance indicates both that the location was important to the builders and that the type of stone was. This same behaviour was repeated at other important megalithic sites such as Stonehenge and Ghiza, where quartz stones were transported over hundreds of miles in order to be used for significant prehistoric structures. The bottom of the stone was beautifully 'keeled'. When did Le Grand Menhir fall? A Picture by Robien from 1725 shows the stone fallen, which places the time of the fall between 1659 and 1725. This information ties in with the suggestion that it fell 'during an earthquake in 1722' (2). The way in which the stones landed supports this theory in computer modelling. The three stones on the left probably broke apart when the top half landed. What was the original purpose of the site? The original construction (of which Le Grand Menhir was only a component) was one of Europe's greatest megalithic achievements. The site was suggested by Prof. A. Thom to have served as a lunar marker, from which it would have been able to calculate the 18.6yr lunar cycle by observing the stone from positions in the surrounding countryside. He predicted the locations of the sites and found ancient markers at several of them, confirming his hypothesis. Prof. Alexander Thom concluded that it was a huge foresight marker for the moon's rising and setting extremes. He made predictions for the directions of eight observing points, of which six have been shown to still have evidence of prehistoric mounds or stones, one of which is ten miles distant. Another 18 stones once stood in a line of decreasing height from Le Grande Menhir. An impression of the design of the original 4,000 BC structure. Where are the other Menhirs ? In 1984, archaeologists uncovered the hidden upper-side of the Gavr'inis capstone and found that it bore engravings that fitted with those at La Table des Marchands, along with another stone on top of the 'Er Vingle' or 'Er Grah' tumulus. 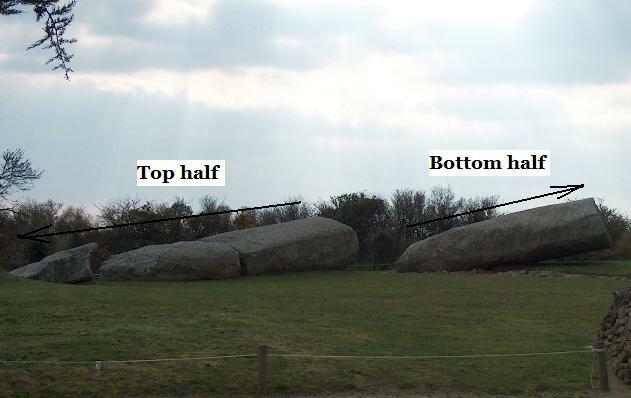 It was concluded that the three slabs once formed a single menhir 15m tall, which if we add another 2-3m for the missing section, results in a stone that measures 17-18m, (which would leave approximately an estimated 15m remaining visible above ground level). The length of the Le Grand menhir is 20m from end to end. If approximately 20% of this stone was originally underground (as suggested by a guide), then we can assume that it actually stood at around 16m above ground level. In order to estimate the expected heights of the other stones, we need the height of the last stone, which we can guess at being slightly over the height of an average observer (we can suggest a height of approximately 2m). If the tallest stood at 16m, the shortest at 2m, and with 17 others in-between, We can now estimate the difference in height between each of the other stones. 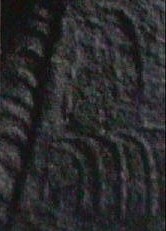 (14m / 17 = 82.353cm), a figure that is coincidentally almost exactly one megalithic yard long (82.966cm). Although it is not possible to be exact about these matters, this result is not surprising as Prof. Thom found the use of the Megalithic yard in other constructions at Carnac. 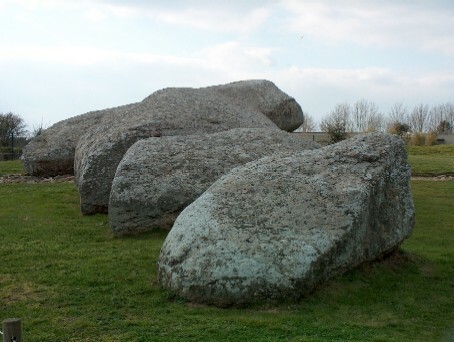 Although the rest of the menhirs appear to have been taken and re-used over time, parts of one remain at the site, having been re-used for the capstones of the neighbouring La Table des Marchands and Er-Grah monuments. 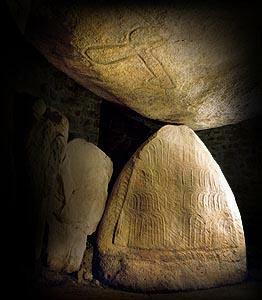 The Table des Marchands cap-stone has several distinct carvings on it and the discovery in 1984 of matching carvings on the cap-stone of the Gavrinis mound confirmed that the three stones fitted together until they were re-used sometime around 3,300 BC. 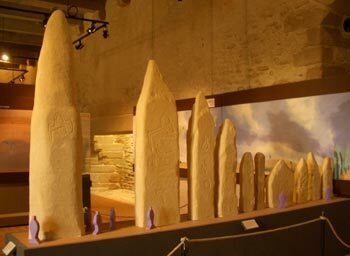 The two menhirs at Mané Er-Hrouk, which are 9m and 7.5m long. The site shows two phases of construction. 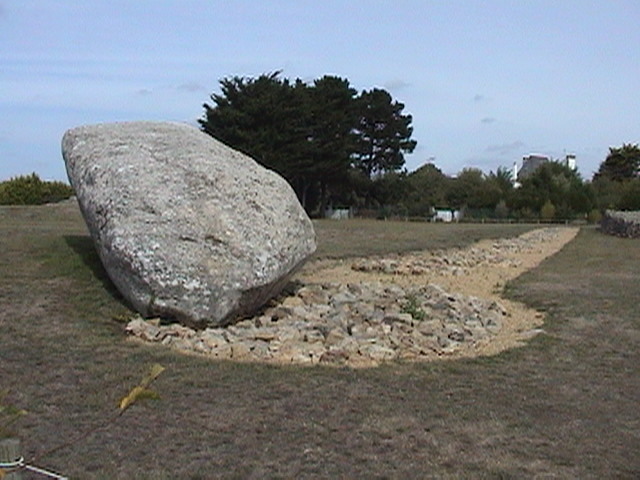 One at approximately 4,500 BC (6), when the initial 19 stones were placed, and the other at approximately 3,300 BC when they were re-used for other local constructions (such as the capstone for the neighbouring passage mounds of La Table des Marchands, Gavrinis and 'Er Grah' tumulus). The inter-visibility of the sites was checked at night with the use of a light mounted on a water tower and found to be satisfactory, thus confirming the idea that someone standing at (the appropriate), one of the eight observing points would have seen the moon set behind the distant spike at its major and minor 'standstills'. It is interesting to note that there are 19 crescent symbols on the top edges of the end-stone inside the Table des Marchands (see left side of photo-right). This number has been suggested as being related to the lunar cycle which lasts 18.6 solar years, supporting the idea that the original site functioned as a means of measuring and calculating the lunar cycles. 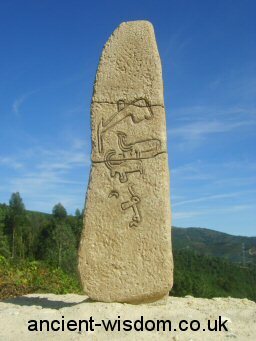 Le Grande Menhir Brisé: Photo Gallery. 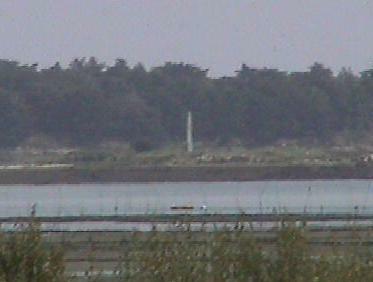 This 'observation stone' across the bay is still visible from 'Le Grande Menhir' (with a zoom lens). A 'Christianised' menhir in the graveyard right next to the Locmariaquer site. 1) Ewan Mc Kackie, The Megalithic Builders, 1977, Phaidon. 2). J. Westwood. The Atlas of Mysterious Places. 1987. Guild Publ. 3). Rene Noorbergen. Secrets of the Lost Races. 1977. New English Lib. 4). J. Michell. Megalithomania. 1982. Thames and Hudson.